Hmm I cannot reproduce that. Anyone else who also has this problem? Oh. Reika has a nuclear storage drum; it's a tile entity that holds waste and allows it to decay. He's also got a tile accelerator that speeds it up. Now it can be sped up even more. Well realize that you can put nuclear waste directly in a trashcan or dump it into the void. This items isn't any more cheaty then those methods. Reika works hard to prevent trashcans, void, etc, from disposing of nuclear waste. Not perfect, of course, and there's always the whole "Toss it through a portal to another world, and never look back". That did work so well for Space 1999 when they used the moon as a nuclear dump way back when, right? Well like all wands in this mod you can configure it (which includes disabling). By default it already uses the expensive recipe. Oh, I'm not complaining. I like the idea of extra-strong magic to solve the issue of nuclear waste. BTW. Reika himself provides tick acceleration in ChromatiCraft. How do these work with his own TE's? You can use magic from CC to remove waste, or now, magic from a high-end wand. Or both. > He's also got a tile accelerator that speeds it up. Is there an issue tracker for the mod hiding somewhere? This has become a handy mod to have in my pack. any thoughts about a wand that can place a block in the air like extra utilities angel block? Actually we are already planning to extend the moving wand with that functionality. Pressing shift will move it against another block (like it does now) and pressing it without shift will place it in the air. Very cool. Keep up the great work on this mod. Feature request, on swapping wand: require that the mining hardness matches. In other words, I can swap stone for stone brick, sandstone for chisled sand stone, etc. 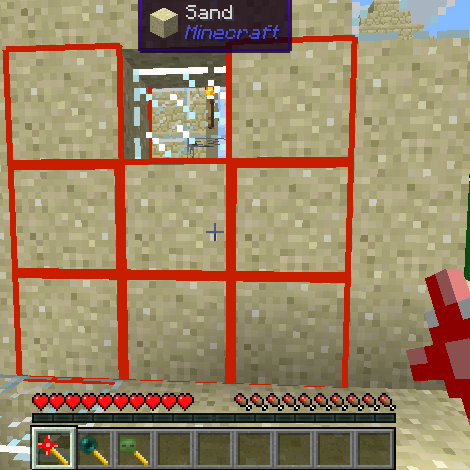 But I cannot do something like swap glass and obsidian, or sand and stone. Perhaps allow some sort of "close counts", so that course dirt for grass (to make a walking path), or sandstone / birch planks for sand (desert paths), etc. (Trying to avoid the worst abuses of equal exchange that I've seen, while still permitting reasonable usage).